The Panthers dogpile after winning the state championship. 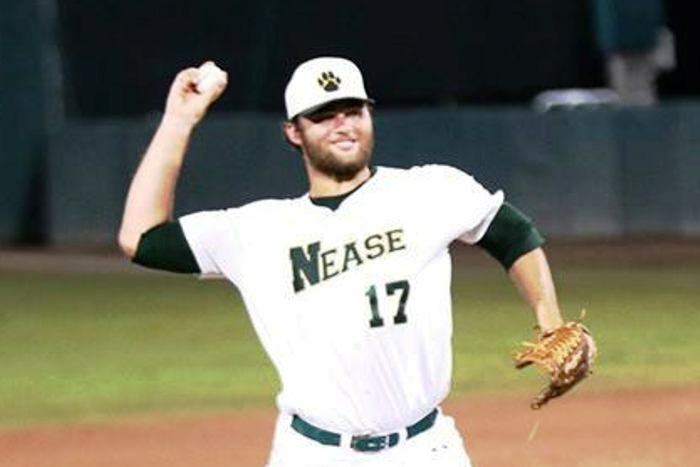 All day leading up to Thursday’s 7A championship game, Nease manager Jeremiah Klosterman admitted that he was feeling uptight as he tried to focus on every little detail to best prepare his guys for the game. Pesky weather issues delayed the game back three hours to a very late-night start, but once it got going Klosterman was the most relaxed he had felt all day. His Panthers came racing out of the gate and never looked back, and now the former college standout at Florida State University whom enjoyed experiences playing in three college World Series and a National Championship has his most coveted accomplishment of them all. 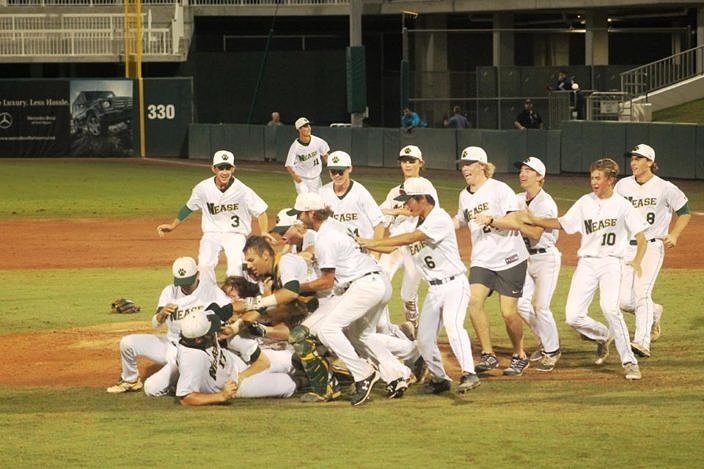 Nease pounded it on early and often to run away with the state title, defeating Tampa King 11-0 late Thursday night at Hammond Stadium in Fort Myers to earn the crown as the state champion of Class 7A in Florida. The Panthers wasted no time in getting to work, taking the lead right out of the chute in the opening frame. Speedy center fielder Jason Sowden ripped a double down the third base line and then came around to score when Collin Garner reached on a throwing error two batters later. After Matt Eden worked a walk to keep things going, starting pitcher Leighton alley plunked an RBI single into shallow left-center field to stake himself a 2-0 lead before he even took the mound. Sowden came back to the plate in the second, where he continued to cause trouble for the Lions. Sowden worked a two-out walk that ended up costing King dearly when Kyle Huber jumped on an 0-1 offering and drove it over the left field fence for a two-run home run and a 4-0 Nease lead. Nease was back at it again in the third. Alley singled through the right side and gave way to courtesy-runner Jared Whittle, who scored thanks to an RBI single to center field from catcher Tyler McKay. Courtesy-runner Jacob Allsup came in to run for McKay, and he scored off an RBI single up the middle by Cody Hargus. King broke up the no-hit bid on a single to center from Dehreon Pressley in the third, but was unable to tally any runs despite putting two runners on base. Sowden and Huber then came up to pile on more runs for Nease in the bottom half of the frame. Sowden singled to center, stole second and third and then jogged home when Huber drove an RBI double deep into right-center field. The Panthers extended the lead with two more runs in the sixth. Sowden was hit by a pitch, stole second and moved to third on a throwing error, before scoring on an RBI single to center from Huber. Pinch-hitter Jay Gallagher then pushed Huber home on an RBI ground out. 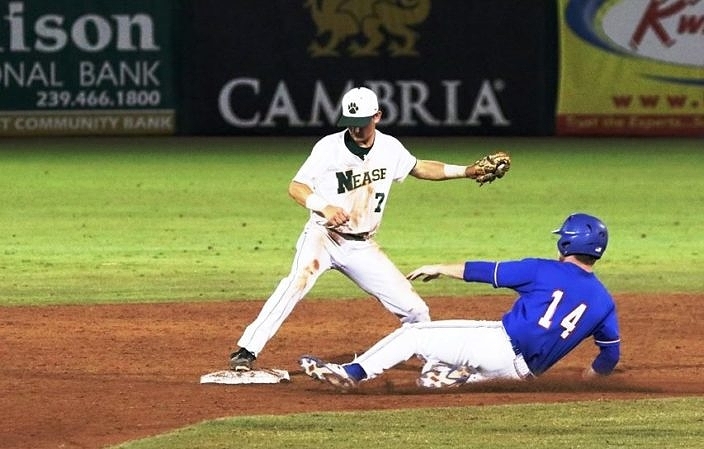 Nease then finished off its big offensive night with two final runs in the seventh. Cody Hargus singled and then scored on an RBI double from Chris Eichorn, who then scored on an RBI double from Huber.